Commodity Plastics and Engineering Plastics. Thermoplastic materials are those which soften on the application of heat and subsequently melt, with or without pressure and require cooling to be set to a shape. Thermoplastics can be reversely melted by heating and solidified by cooling in limited number of cycles without affecting the mechanical properties. On increasing the number of recycling of thermoplastics may result in color degradation, there by affecting their appearance and properties. In the molten state, they are liquids, and in the mushy state they are glassy or partially crystalline. The molecules are joined end-to-end into a series of long chains, each chain being independent of the other. Above the melting temperature, all crystalline structure disappears and the long chain becomes randomly scattered. The molecular structure of thermoplastic (figure 1) has an influence on the chemical resistance and resistance against environmental effects like UV radiation. The properties may also vary from optical transparency to opaque, depending on the molecular structure. The important properties of the thermoplastics are high strength and toughness, better hardness, chemical resistance, durability, self lubrication, transparency and water proofing. With the application of heat, thermoplastics softens and it can be moulded into desired shapes because they are highly plastic. Some thermoplastics can be joined with the application of heat and pressure. There are several techniques available for the joining of thermoplastics such as mechanical fastening, fusion bonding, hot gas welding, solvent bonding, ultrasonic welding, induction welding and dielectric welding. The different types of thermoplastic are: Acrylonitrile Butadiene styrene (ABS), Acetals, Acrylics, Cellulosics, Fluorocarbons, Polyamides, Polycarbonates, Polythylene (PE), Polypropylenes (PP), Polystyrenes, Polyvinyl chloride (PVC), Liquid crystalline polymers (LCP), Polyphenylene sulphide (PPS) and Vinyls. The property of material becoming permanently hard and rigid after cooling when heated above the melting temperature is called thermosets. The solidification process of plastics is known as curing. The transformation from the liquid state to the solid state is irreversible process, further heating of thermosets result only in the chemical decomposition. It means that the thermosets can't be recycled. During curing, the small molecules are chemically linked together to form complex inter connected network structures (Figure 2). This cross-linking prevents the slippage of individual chains. Therefore, the mechanical properties (tensile strength, compressive strength and hardness) are not temperature dependent, as compared to thermoplastics. 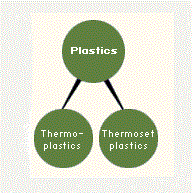 Hence, thermosets are generally stronger than the thermoplastics. The joining of thermosets by thermal process like ultrasonic welding, laser welding and gas welding is not possible, but mechanical fastening and adhesive bonding may be used for low strength applications. The different types of thermosets are Alkyds, Allylics, Amine, Bakelite, Epoxy, Phenolic (PF), Polyester, Silicone, Polyurethane (PUR) and Vinyl Easter. Thermosets are commonly used for high temperature applications. Some of the common products are electrical equipments, motor brush holders, printed circuit boards, circuit breakers, encapsulation, kitchen utensils, handles and knobs, and spectacle lenses.